Call for Recipes: Inspired Slow Cooker Recipes! A reader named Tony emailed me recently requesting a Call for Recipes. I LOVE Call for Recipes posts. They make me happy, seeing all your favorite recipes. I especially love it when the theme of these posts comes from one of you, which they often do! Tony recently found a slow cooker cookbook that was inspiring, including a recipe for cake. Tony’s reaction was, “Slow cookers can bake a cake?!? !” So, Tony hit the keyboard and sent me a great email, including this: Almost everyone has a slow cooker from their wedding, but many hardly use them, so it was inspiring to learn that breakfast foods, cakes and other non-traditional foods were possible in a slow cooker. With the holidays coming up, having easy to prep and serve food is a necessity, but great/creative recipes for the slow cooker have been few and far between. Thus today’s Call for Recipes was born! 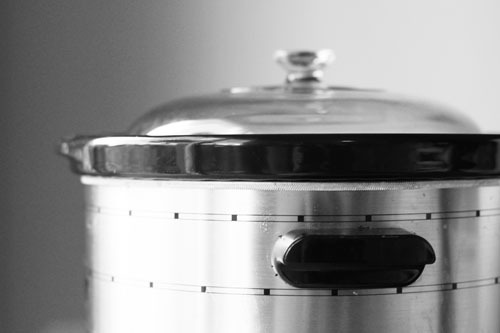 Tony and I want you to share your favorite traditional and non-traditional slow cooker (a.k.a. crock pot) recipes. Tony thought it would be cool to see what ideas are out there, and I agree! Can’t wait to see your creative and fun slow cooker recipes! I’ll admit, my slow cooking experiences have not been very out-of-the-box. I love to make pulled pork, teriyaki chicken and pot roast with my slow cooker. These are all great recipes, but that’s about all I’ve got up my slow cooking sleeve. 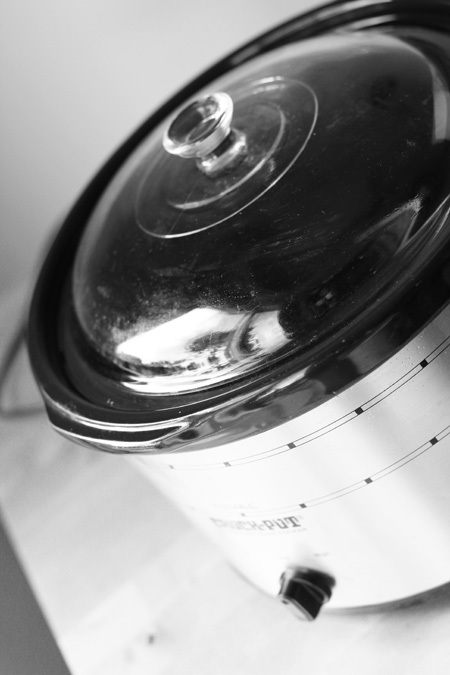 My slow cooker is hoping you will have something fun for it to try! Please note, if you have a slow cooker recipe that isn’t necessarily fun and creative but still wonderful and delicious, please feel free to share it! Directions: Cut all the vegetables (baby carrots excluded) cover +2 cups water.Salt and Pepper to taste. This is not a spicy soup,just very flavorful! Oops..place it all in the slow cooker on High for 5-6 hrs. Use an immersion blended to blend the soup. Okay, so this isn’t exactly gourmet, but it’s good, it makes a ton and it’s got to be better than the boxed stuff, right? Oh, and I would definitely use a crockpot liner for this – otherwise cleanup can be a bit of a chore! Place macaroni in a 5-quart slow cooker, add melted margarine and stir. In a separate bowl, combine the eggs, evaporated milk, soup, milk and 3 cups of the shredded cheese. Pour the egg mixture over macaroni. Stir to combine, cover and cook on low for 4 hours. Sprinkle with remaining shredded cheese. Cook 15 min longer or until the cheese is melted. Sprinkle with paprika before serving. These Korean Beef Tacos with Cucumber slaw are so yummy! It makes a ton though, so you could either freeze half or cut the recipe by half. I made it the other night for 5 adults and two kids (who eat at least one taco each) and there was still tons left over. Pierce several times with a fork. That’s it. We then put out toppings cheddar cheese, steamed broccoli, bacon or pulled pork. Everyone gets the loaded baked potato they want with minimal effort. The skins on these potatoes are soooo much better than in a microwave. It’s like they were perfectly baked in the oven. I have a recipe link for Pineapple Upside Down Cake in the crickpot…there are tons of variations and from scratch ways to bake one. However, if you are trying for an easy, yummy cake …without the stress and in a crockpot; then this will fit the bill. This site also has a ton of other crockpot recipes. Also, I own a crockpot cook book called ” Fix it and Forget It” also the “light” version, I find they have alot of variety. Any who…here’s my recipe find. This isn’t a recipe but a helpful bit – Whenever I have a large meal to get ready and mashed potatoes are on the menu, I make them first and keep them warm in the crockpot. I’ve kept them in there on warm/low for 2 hours and they’re hot & delicious when everything else is ready. Slow cooked shredded chicken with corn, tomatoes and black beans. Prep this the night before and turn your crock pot on in the morning for an easy weeknight meal. Serve over rice or in a bowl with nachos on the side, and don’t forget the toppings. Chopped scallions, fresh cilantro, fat free yogurt or sour cream and reduced fat cheddar are my favorites. Crock Pot Sante Fe Chicken came in first place (yay!) for Ziplist’s most saved recipe in 2012 (they have over 800K recipes). I’m thrilled, and I see why you would choose this one! It’s delicious, easy, requires no pre-cooking, and everyone loves an easy slow cooker recipe. It’s also kid-friendly, freezer friendly and gluten-free. In it’s honor I decided to revive it from the archives and give it some love. Combine chicken broth, beans, corn, tomatoes, cilantro, scallions, garlic powder, onion powder, cumin, cayenne pepper and salt in the crock pot. Season chicken breast with salt and lay on top. Cook on low for 10 hours or on high for 6 hours. Half hour before serving, remove chicken and shred. Return chicken to slow cooker and stir in. Adjust salt and seasoning to taste. Serve over rice or tortillas and your favorite toppings. Mix together seasonings & rub pork with this season blend. Sear pork over med-hi in oil. Cur oranges in half & juice into bottom of crock pot. Put pork in crock pot & top with garlic, chipotles, & adobo sauce. Cook on low for 8 hrs. Shred for tacos. Place the chicken breasts in the bottom of your slow cooker. Add in the corn, tomatoes, chicken broth, enchilada sauce, green chiles, onion, cilantro, bay leaves, garlic, cumin, chili powder, salt, and black pepper. I used the BIG 28 oz can of San Marzano tomatoes. These really are the best tinned tomatoes. I used the 28 oz size of Juanita’s red enchilada sauce. I got the Ortega fire roasted diced green chiles. They have more flavor with the fire roasting. Also, I did not use cilantro because I don’t like it. But, if you like cilantro, I’m sure it would add a wonderful depth to the soup. Lastly, I topped ours with chopped avocado, cherry tomatoes, Frito’s and sour cream. The fresh tomatoes and avocado give a great bright flavor to the smokey soup. Enjoy! I love my crockpot, but must admit that I lack ideas for creative recipes (I suppose my standard for crockpot recipes is that it has to be easier than cooking the dish the traditional way).